COCONUT CREEK, Fla. – (April 9, 2018) – For the past five years, Minto Communities has generously supported Junior Achievement of South Florida. Recently, a group of employees presented the organization with a symbolic check for $162,500 which represents the total amount of money given to date. Minto has a storefront at Finance Park at JA World Huizenga Center at the Lillian S. Wells Foundation, located on the North campus of Broward College in Coconut Creek. Finance Park is a simulated city of storefronts representing various industries and businesses. This is where 8th grade school students apply the personal finance and career knowledge they gain in the classroom. During the Finance Park simulation, students gain invaluable knowledge about renting, buying or leasing a home, and the process of applying for a mortgage. In addition to the $32,500 it gives to JA annually, Minto also encourages employees to visit Finance Park to work with the kids. On the day of the check presentation, about 20 employees volunteered their time to help out. Svopa said the company plans on continuing its financial support of JA this year and into the foreseeable future. JA Finance Park is a center comprised of 16 local business storefronts. During their day, students engage in creating and maintaining a personal budget, while taking into considering such factors as health care, real estate, car payments, shopping, banking, utilities and more. Minto has been developing communities and building award-winning homes in South Florida for the past four decades. Its local office is located in Coconut Creek. For more information about Minto Communities, visit www.MintoUSA.com. 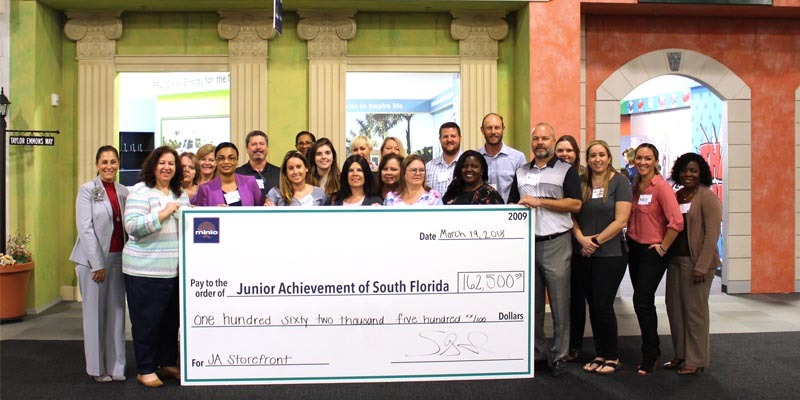 The Minto Communities team recently volunteered their time in JA Finance Park and presented Junior Achievement of South Florida President/CEO, Laurie Sallarulo (far left) with a $162,500 check as part of the company’s storefront sponsorship contribution. Junior Achievement of South Florida (JA) inspires and prepares youth to succeed in a global economy. JA provides real-world training in financial literacy including budgeting, spending, investing and the use of credit; offers cutting-edge skill-building opportunities that enable young people to explore meaningful, productive careers; teaches students how to start businesses; and introduces entrepreneurial values that strengthen workplaces. Last year, with the help of over 5,800 trained corporate and community volunteers, JA delivered over 20 various programs to almost 50,000 students in classrooms throughout Broward and South Palm Beach Counties and at JA World Huizenga Center at the Lillian S. Wells Foundation, a first-class facility housing JA BizTown and JA Finance Park. For more information about Junior Achievement of South Florida, visit www.jasouthflorida.org.